When hearing this, every IT administrator gasps. 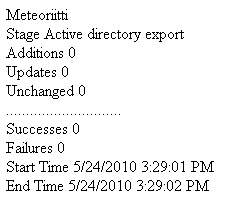 Will SP2010 mess with my Active Directory? Suspicions arise when SharePoint guys come to visit and ask for “Replicating Directory Changes” permissions in AD. 1. “Authenticated users who have Replicate Directory Changes permissions will be granted read-access to AD DS objects.” This is done by the AD administrator and is required also for one-way import. 2. “Additional permissions can be granted using access control lists (ACLs) in AD DS. SharePoint Server 2010 will not write profile data back to AD DS unless Write permission is explicitly set on the account that has Replicate Directory Changes permissions.” This is also done by the AD administrator and is required only for the two-way synchronization. 3. “By default, no user profile property is set to Export. You must explicitly define the user profile properties that you want to export back to the directory service from the user profile store.” This is done by SharePoint administrator and is required only for the two-way synchronization. As a summary: SP2010 contains two-way profile synchronization with AD, but it has to be explicity enabled in both AD and SP2010. I’m glad to read this. However, it would be useful to find a more comprehensive description of these permissions, in order to convince AD admins to assign it to a SharePoint account. You’re right, the first thing they say is “I have to check it, because if something wrong happens, AD might be irreversibly corrupted”. MS is telling us the Full version of FIM 2010 is not copatible with SP2010 (as of Today 3/1/2011). True? So what’s missing from the version of FIM 2010 that SharePoint installed and appears to be using? We have a simple requirement to allow users to change their own passwords? Will the version of FIM installed with SP2010 allow this, or do we need the full version of FIM 2010 and again, will that install and work with SP2010? Also, say we keep the above requirement on a seperate serve and only want to do user profile imports (no updating of AD), Can we remove privildeges from our Service account for Replication and Create Child on AD? And finally, the User profile Sync connection screens are very different, I’m not finding where to add filters. Is there another screen for Imports that’s not the Sync connection screen? is there any way we can use user profile synchronisation with only read rights in AD, i have a local sharepoint in a large international company and the right will be given to me. ” Consuming another 10 hours of their day for a 1-hour outing. If the clawfoot tub shower is second hand have a look at the device for anything important that you can search on Google with. Now I’m NOT talking about the urge to pee after being in warm water which causes a parasympathetic stimulation of the detrussor muscles of your bladder and relaxes you and makes you want to pee in the nice warm clawfoot tub shower (as many of you likely do). taboo subject but usually people do not talk about these subjects. It’s been confirmed – Nikkole’s been lying about having a dead son. of lies during which she has been squandering for 9 months. completely innocently on the lookout for a toy for her son. holding the final instance of the toy they each need. law. The companies that work in payday loans need certain numbers in order to receive their repayments. that you are applying for a cash advance loan. huge component of folks will leave out your wonderful writing because of this problem. you’ve done a fantastic process on this subject! along with your quite own laptop or computer. Colleges are trying to find new approaches to help students stay afloat in our sea of info. assortment of laptops can be obtained for a consumer to pick from based on one’s taste, requirement and pocket. While we all need a laptop bag, students will require them for obvious reasons. more conscious on the time of getting. worrying about security measures again. The main aspect of any home security cameras amazon security system is the detection device.